It's been a while since my last empties post in October last year, and since them, I've accumulated a loooot of empties to show you guys! To be clear though, not alll of these are my empties, there are a few bits and bobs in there that are contributed by my mother and sister, because they do help themselves to some of my skincare products from time to time! I'm happy to let them indulge though, because to be honest, I obviously have way more skincare than I can ever use up! The products I (with a little help from mum and sis) have used up really run the gamut - every step of the skincare and makeup routine is covered here! But because this would be too long of a post, I've split it up into two. For today, we'll just cover the acne skicare (unfortunately this is all mine, my mum and sis have way better skin than me, sigh), lotions and toners, as well as cleansers and makeup removers. Who's been a good girl and using up all her skincare before opening a new one? Yours truly! So, without further ado, let's get started! I'm officially going to cram a bunch of mini-reviews together into this blogpost, so let's hope this doesn't end up being too long! 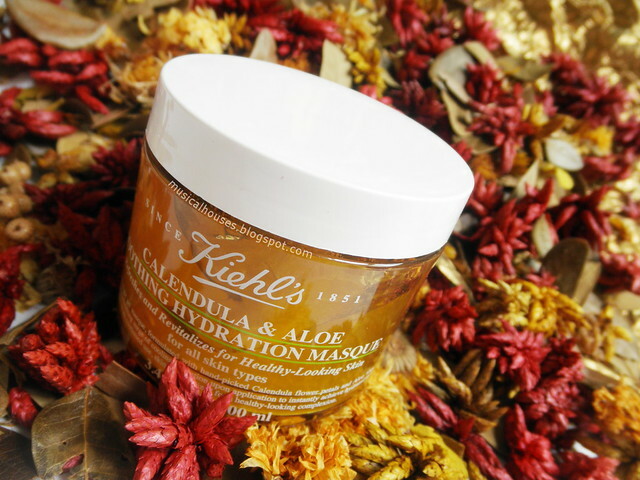 Kiehl's Calendula and Aloe Soothing Hydration Masque was just launched earlier in April, and I fully expect this mask to be popular for one big reason - calendula. If you're familiar with the Kiehl's brand, then you'll know that one of the bestselling flagship products is the Kiehl's Calendula Toner, as a gentle and hydrating toner (which I'm also using right now - I need to get around to reviewing this one day!). Of course, the product line also includes a Calendula Foaming Face Wash. Now, the Calendula line of products has been extended further with the introduction of the Calendula & Aloe Masque, which is a pretty smart move given the popularity of the Calendula range. According to Kiehl's, the Calendula & Aloe Soothing Hydration Masque has "hand-picked Calendula flower petals and Aloe Vera, [and] bursts into a refreshing surge of cooling hydration upon application to instantly achieve hydrated and soothed skin". Kiehl's also claims that you only need to leave this mask on for 5 minutes to get the hydrating and soothing effects, although you can leave it on longer if you wish. The product is suitable for both day and night use, but night use is preferable. So, does the Calendula & Aloe Masque live up to its claims? Can it really soothe the skin? Well, we'll find out by looking at the ingredients inside the mask!